THIS IS A DEDICATED CONCERT RETURN BUS TO ROLLING STONES. 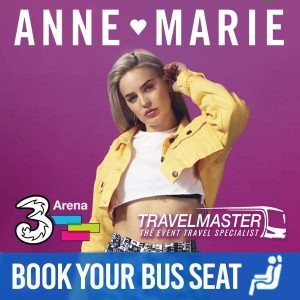 THE BUS WILL DROP ALL CUSTOMERS TO THE COACH PARKING IN ALFIE BYRNE ROAD AND PICK UP FROM THE SAME LOCATION 45 MINUTES AFTER THE EVENT FINISHES. TravelMaster offer a Direct Return Bus to Rolling Stones Concert! Now you can take the hassle out of travelling to and from concerts. Relax and enjoy your trip in comfort on our modern coaches. The concert takes place in Croke Park, Dublin on the 17th of May 2018. We have multiple pick-up points throughout Munster and beyond. How do I buy a ticket for a bus to Rolling Stones? On this page first, select the County you wish to travel from. After that choose how many Bus Tickets you need. Directly – we drop you outside and pick you up directly outside the concert. Our bus to Rolling Stones means no walking, no queuing for Luas or any other transport such as taxis or connecting buses. Safely – We wait for you (up to a certain point of course ;). We have your contact details on our system in case we need to contact you.